Now who doesn’t love a hot chip? Fries? Potato chips? Whatever you call them, they’re addictive, timeless and delicious, we just can’t deny it! When you were younger, were you like me and each time you went out to dinner at a restaurant you ALWAYS ordered the ‘bowl of chips’ ? Hahaha I feel you! Now I’m grown, I order with more variety and if I had eyes bigger than my stomach, I would most definitely still order the bowl of fries with my other meal but as I said, sometimes it’s just too hard to finish it all. First world problems right? I had a big craving for fries last week (when do you not have a craving for fries?) so I decided to whip up a big batch of oven-roasted fries for lunch. To jazz it up even more, I’ve been wanting to actually make a tasty peanut butter dip/sauce and finally get it made right, just like what you enjoy at the restaurants, especially Thai and Indian food – YUM! 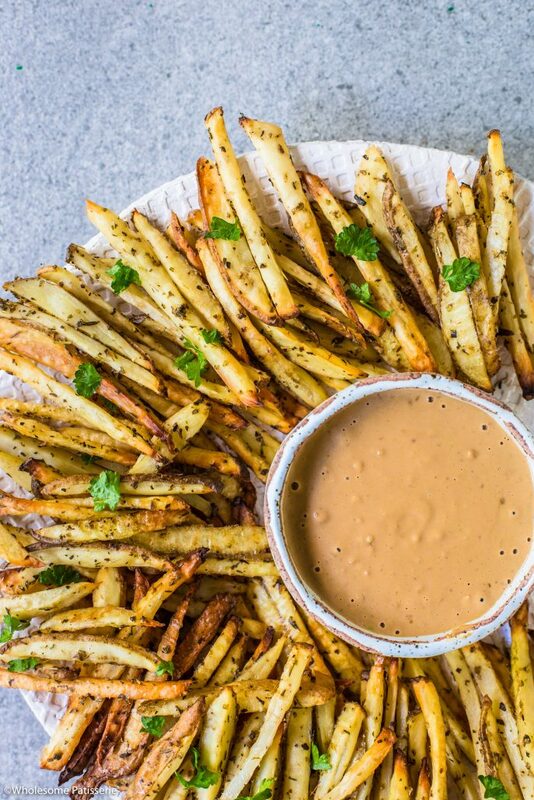 You may be thinking that fries served with a savoury peanut butter dip is a little unusual? Well I agree with you, if that’s what you’re thinking but I’m here to tell you, the combination of the two is a-maz-ing!!! 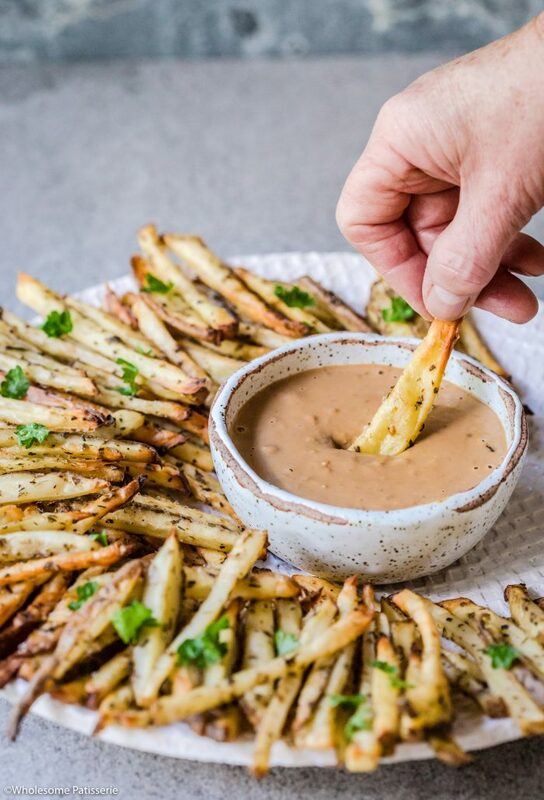 So next time you’re craving fries, make yourself a homemade batch and make this super quick and simple peanut butter dip to serve with them, next level deliciousness! Pre-heat oven to 200ºC (400ºF). Line a baking tray with parchment paper, set aside. Cut potatoes into thin fries by slicing them lengthways and cutting them into long thin fries. Lay potatoes out on a few sheets of paper towel and pat them dry. Leave them for 5 minutes and pat them dry one last time. Place potatoes into a large mixing bowl and drizzle over oil and season with dried herbs and pink salt. Mix until well coated. Arrange potatoes in one layer across the lined tray. Use 2 oven trays if needed. Roast in the oven for 35-40 minutes or until golden and crispy. You can flip the fries halfway through roasting. 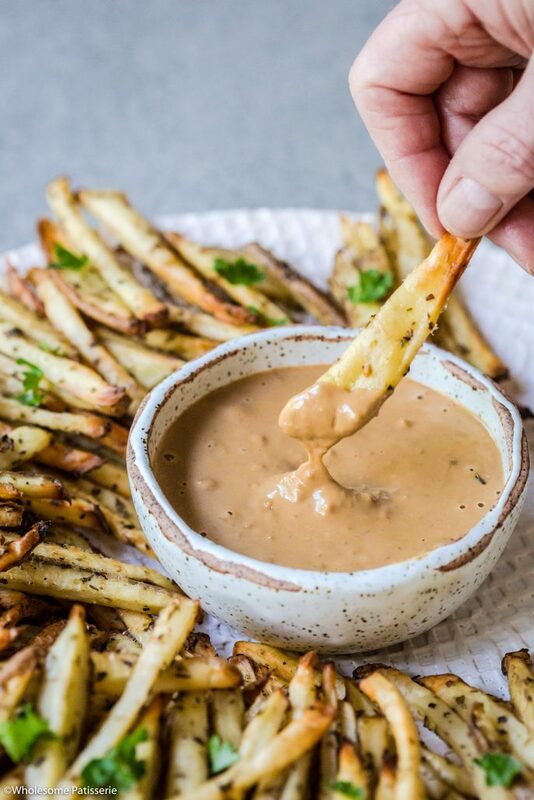 Make dip whilst fries are cooking. In a mixing bowl, add all ingredients except the water. Mix until ingredients are just incorporated. Using a whisk, gradually pour in the water and whisk mixture until well combined, smooth and light in colour. When fries are ready, transfer them to a serving platter and place the dip in the middle. 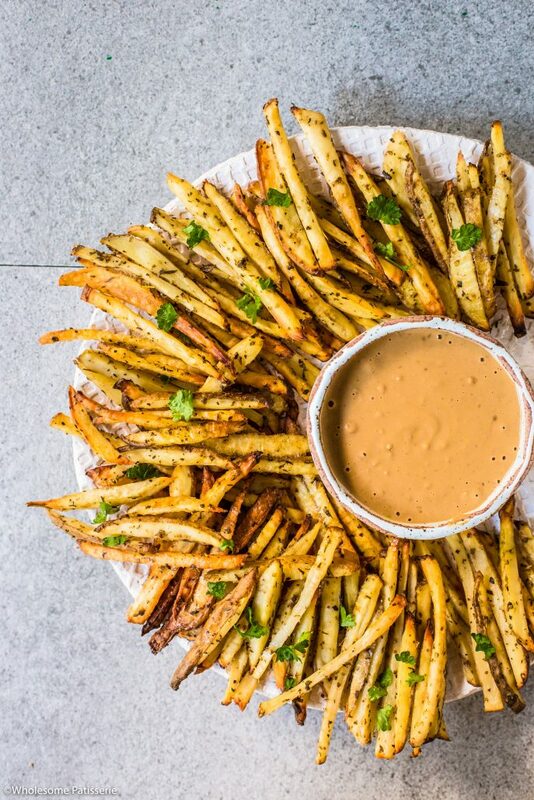 Sprinkle fries with fresh chopped parsley. Store leftover fries in an airtight container, refrigerated, for 2-3 days. Store leftover peanut butter dip in an airtight container, refrigerated, for 2-3 days. ?? Leftover fries ! Seems a bit too delicious for that.